Office Star - Breathable mesh mid-back executive chair with built-in lumber support and locking tilt control. 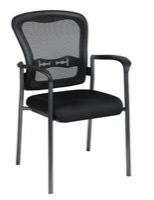 Office Star - Breathable mesh mid-back executive chair with built-in lumber support and locking tilt control. ProLine II Collection - Deluxe High Back Soft Leather Chair with Padded Loop Arms and Chrome Base. ProLine II Collection - Deluxe High Back Soft Leather Chair with Padded Loop Arms and Chrome Base. ProLine II Collection - Deluxe High Back Soft Leather Chair with Padded Loop Arms and Chrome Base. Work Smart Collection - Deluxe High Back Black Glove Soft Leather Chair with Padded Loop Arms. ProLine II Collection - Deluxe Mid Back Soft Leather Chair with Padded Loop Arms and Chrome Base. ProLine II Collection - Deluxe Mid Back Soft Leather Chair with Padded Loop Arms and Chrome Base. ProLine II Collection - Deluxe Mid Back Soft Leather Chair with Padded Loop Arms and Chrome Base. 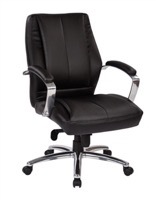 Regency - Solace office chair with black leather seat with adjustable height, 360 degree swivel, and knee tilt control.